Prev A Magical Unicorn Bento Box Kids Lunch Next Leprechaun Cupcakes (and Free Toppers) for St. Patrick’s Day! For most of my adult life I’ve been hearing about how awesome roasted vegetables are. I agree they are delicious, but what I didn’t get or understand were the people who roasted a big tray of them once a week. 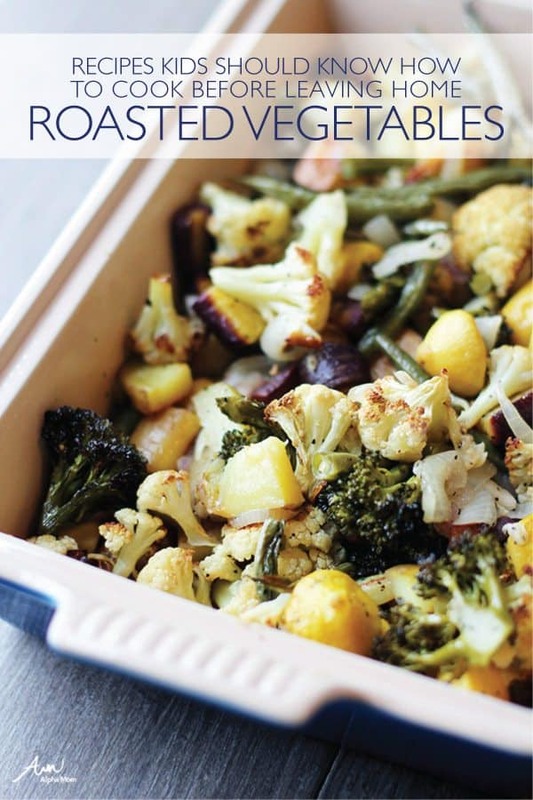 They claimed that it was wonderful having the roasted veggies on hand throughout the week for all kinds of uses. I kind of didn’t believe that it would be all that helpful. But recently that all changed and now I am a firm believer in the weekly roasted vegetables trick! What changed is that I started going to our local farmer’s market each week. I grab whatever the farmers’ happen to have available that week, bring the veggies home and roast them all together. And, my friends were right! 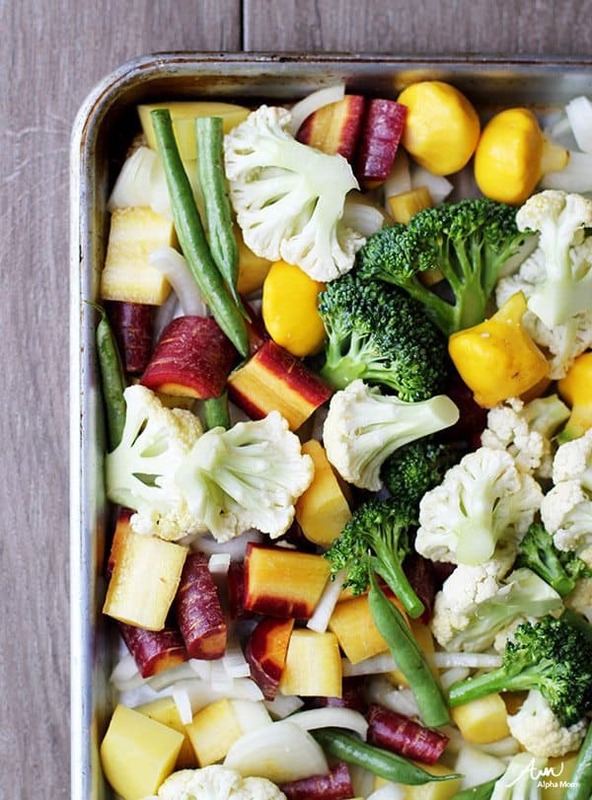 Having those roasted vegetables waiting in the fridge is the best! They make for a great add-in for all kinds of recipes, from pastas to soups to eggs, and they are delicious on their own and a good go-to side dish with lots of different kinds of dinners. The best part is that roasting vegetables is super easy. I just wish I’d been roasting vegetables on a weekly basis my whole life…but at least now I can pass this know-how onto my kids before they leave home. They’ll be much better off than I was in the vegetable department! So, we’ve included Roasted Vegetables in our series on Recipes Kids Should Know Before They Leave Home. 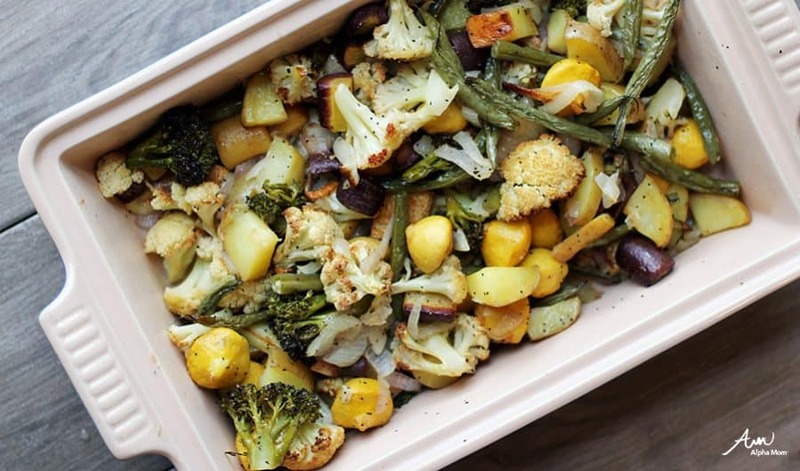 My kids have been helping me with our weekly roasted vegetables dish – their favorite part is to help cut up the vegetables. And I am so happy that this “recipe” is in their arsenal for when they leave home one day! Vegetables good for roasting: You can do just a few kinds or a large variety. 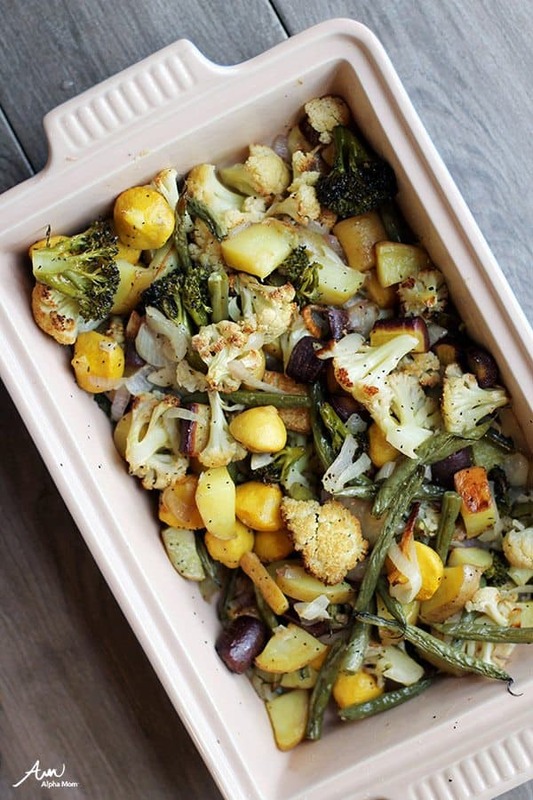 Good vegetables for roasting include: potatoes, cauliflower, broccoli, green beans, mushrooms, tomatoes, carrots, turnips, parsnips, onions, squashes, bell peppers. Note: I always include onions because they add great flavor to whatever vegetables we are cooking. Wash vegetables under running water in the sink by hand. For vegetables like potatoes that are sometimes a little extra dirty, scrub well in the water either with a vegetable brush or your hands. For potatoes: you can peel them if you want but you don’t have to. For sweet potatoes and winter squashes (like butternut): You should peel those vegetables before cutting. Summer squashes and zucchini do not need to be peeled. Cut the vegetables into evenly-sized, bite-sized pieces. It doesn’t need to be exact but you want things pretty uniform so the vegetables will cook evenly. I will often cut the harder vegetables a little bit smaller so that they will cook as fast as everything else. For really hard vegetables like squash and sweet potatoes, be very very careful and maybe even let an adult help you cut them up! If you are using a vegetable like butternut squash and it has seeds inside, be sure to scoop the seeds out before cutting. Spread the cut vegetables on a large, rimmed baking sheet in an even layer. Drizzle the vegetables with olive oil, drizzling evenly over all the vegetables. Use your hands to toss the vegetables on the tray in the oil, to coat the pieces evenly. Sprinkle the vegetables lightly and evenly with salt and pepper. I like to do one more toss with my hands to spread the salt and pepper around. Place the baking sheet in the oven and cook the vegetables for about 20-40 minutes. The cooking time will depend on which vegetables you choose and how you cut them. Stir and flip the vegetables with a pancake flipper after about 10 minutes. Start checking for doneness when the vegetables have been cooking for about 15-20 minutes, then check every 5 minutes after that until the vegetables are tender but not mushy. You can use a thin, sharp knife (like a steak knife) to test for how soft the vegetables are. The best way to tell if they are done is by using a knife to check how they feel. Gently insert the tip of the sharp knife into the hardest of the vegetables being roasted – if it enters easily then the vegetables are done roasting. Once the vegetables are done, remove the baking sheet from the oven. Serve immediately or store in a container with a lid in the refrigerator. The vegetables will stay yummy for about a week. Find more Recipes Kids Should Know How to Cook Before They Leave Home here. Jane Maynard is a mom, wife, graphic designer and blogger living in the San Diego area in sunny Southern California. Jane started her food blog This Week for Dinner 9 years ago and has been posting weekly meal plans ever since, in addition to recipes, travel, kitchen tips and more. Jane writes for the food sections of several websites and is always busy cooking up something new! Jane is pretty much obsessed with chocolate chip cookies and does not want to fix that about herself.